1. Son of Helon and leader of the tribe of Zebulun at the time when the census was taken in the wilderness (Num. i. 9; ii. 7; vii. 24, 29; x. 16). 2. A Reubenite, the son of Pallu or Phallu, father of Nemuel, Dathan, and Abiram (Num. xvi. 1, 12; xxvi. 8; Deut. xi. 6). 3. One of David's brothers, the eldest of the family (I Chron. ii. 13; I Sam. xvi. 6; xvii. 13, 28). In I Chron. xxvii. 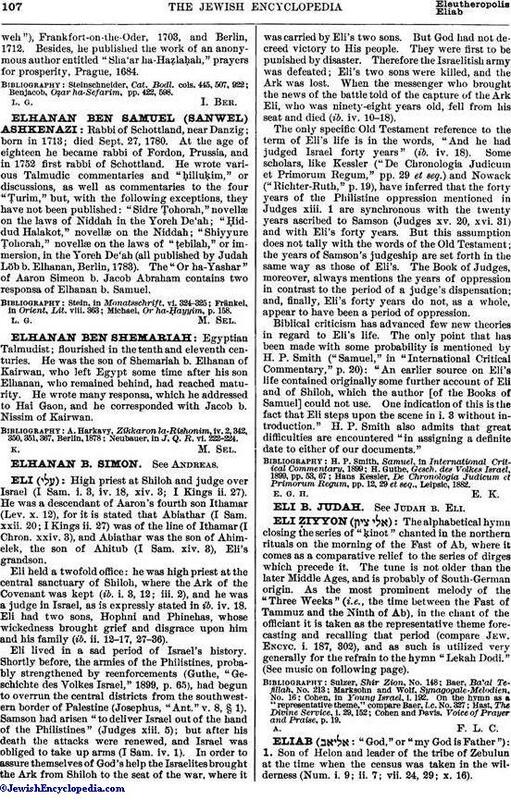 18 mention is made of a certain Elihu as one of the brothers of David. But "Elihu" is probably a variant for "Eliab" (comp. Jerome, "Quæstiones Hebraicæ," ad loc.). 4. A Levite in the time of David who was both a porter and musician (I Chron. xv. 18, 20; xvi. 5). 5. One of the warlike Gadite leaders who came to David when he was in the wilderness (I Chron. xii. 9). 6. An ancestor of Samuel the Prophet; a Kohathite, son of Nahath (I Chron. vi. 12 ). In I Sam. i. 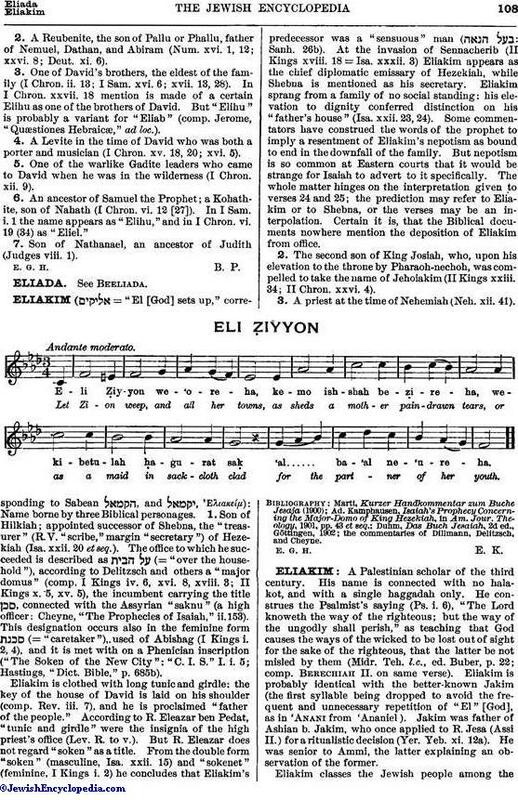 1 the name appears as "Elihu," and in I Chron. vi. 19 (34) as "Eliel." 7. Son of Nathanael, an ancestor of Judith (Judges viii. 1).